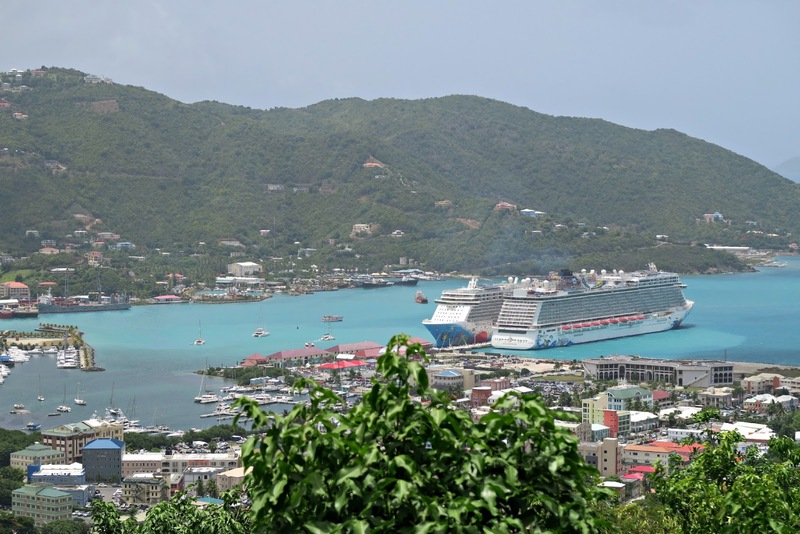 My family and I just came back from our Caribbean cruise on the Norwegian Breakaway cruise line, so I thought I'd share some of our experience as well as the islands we got to visit! This is, by far, the biggest cruise ship my family and I have ever travelled on - it can hold up to 4,000 passengers! I liked how our cruise ship stood out from the others with the unique drawings scattered on it such as Lady Liberty, the sun, doves, music notes, and other pastel planets. Better than a plain white surface if you ask me! As we boarded the ship, the first thing I noticed in the grand lobby was this magnificent spiraling chandelier of glass tubes that would light up into different colors throughout the day. I admired the swirly designs on the big surrounding white columns, as well as the twinkling dots of light on the ceiling that seemed to suggest fairies were living up there. It made the room seem magical and enchanting. Walking through many narrow hallways, we sought out our rooms on the 11th floor. 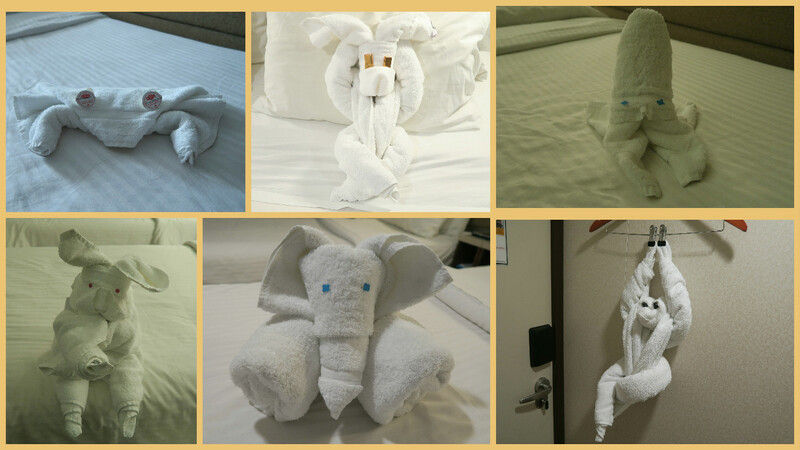 One creative thing that the cleaning staff would do throughout the week while preparing our rooms would be configuring new "towel animals" on our bed. In other words, they essentially used some bathroom towels to represent different animals such as a rabbit, a crab, an elephant, a bear, and even a monkey dangling from a hanger near our front door! That one was quite a surprise as I opened the door and had it popping out at me! Another thing I liked was how the cooking staff in the Garden Cafe (the large buffet that everyone could eat at anytime of the day) sculpted the pieces of fruit, particularly the watermelons. They were crafted into the prettiest flower designs. 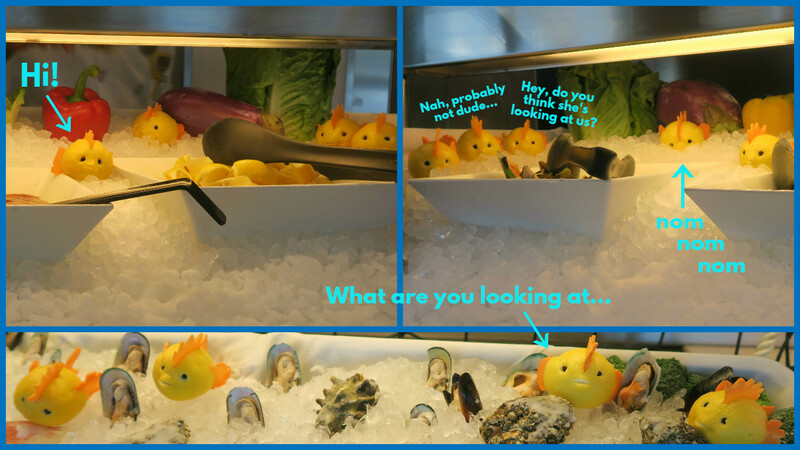 Then came the adorable little sea creatures fashioned from fruits and vegetables. I mean, how can someone not fawn over the cute little "lemon" fishies? So clever! The melon looks perfect for an egg! This owl looks so dressed up, he reminds me of the owl from "Sleeping Beauty" who wore the prince's cloak! Since we were leaving from New York City, we got the pleasure of observing the Statue of Liberty in all its glory. It's been quite a while since I've seen Lady Liberty so I made sure to take some up-close shots! After 3 days of the best smooth sailing that fighting against the current can offer, we finally landed in San Juan, Puerto Rico. 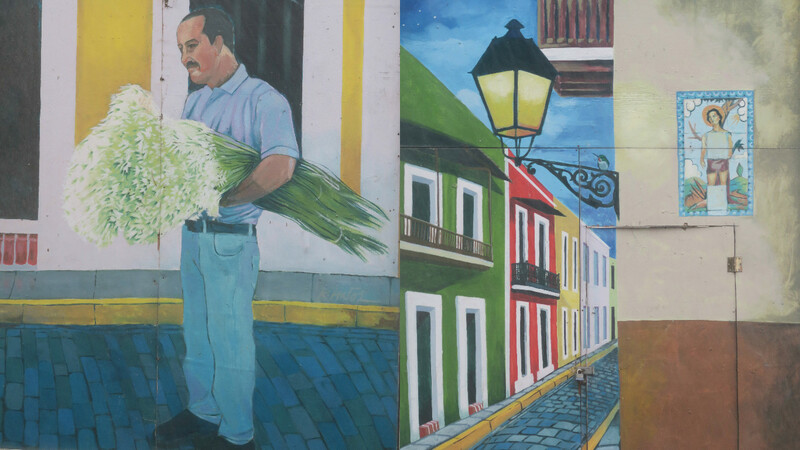 Interestingly, Puerto Rico is known for its pharmaceutical aspect as its the number one industry, even topping tourism. 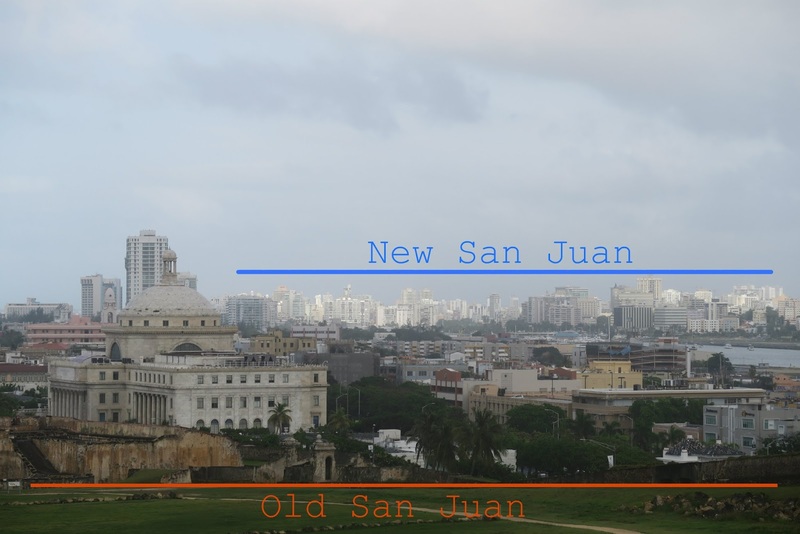 San Juan is also split up into old and new parts. Modernism is slowly seeping its way into the architecture of the new buildings under construction so the local government is trying to preserve what is left of the colonial roots. Therefore the old San Juan is more Spanish colonial and the new San Juan is more neoclassical. Since we had to be back on board at a set time, we could only linger at the beach for 15 minutes, but it was nice getting to dip our feet in and cool off. Then we got to tour the Castillo San Felipe del Morro which is this monumental Spanish fort from the 16th century. I've gotten the chance to explore many century-old forts across America, but this one was unique in how we were allowed to climb to the top and observe the sea through the look-out towers. I've never walked through such spacious and dimly-lit tunnels before. Can't deny that I almost felt like I was an adventurer on a quest, trying to find out where the tunnel would lead me and if I would ever return to the daylight. Making it back to civilization, we traveled through the town on a tour bus, admiring the different colored buildings - a theme which would reoccur throughout all of the islands we would visit. Love the light blue color as well as the eyes on it! Unfortunately, it started to downpour so we took refuge under some shop balconies. I didn't mind as it gave me more time to absorb my surroundings as well as the scenic paintings across the street! We took a sky-ride to get a better view of the island, despite the fog from the mild rain. To be honest, the rain seemed to be following us to whichever island we ventured to! Look at all those chickens... I mean houses! Reaching St. Thomas Beach, we spent a couple hours wading in the ocean and tanning in the sun. On our way back to the ship, we came across a multi-colored Volkswagen Bug, so I had to take a picture of it! This man was cutting the tops of coconuts and selling them so my sister decided to buy one. Usually I don't prefer coconut water but the water from this coconut was actually sweet enough for me to handle! 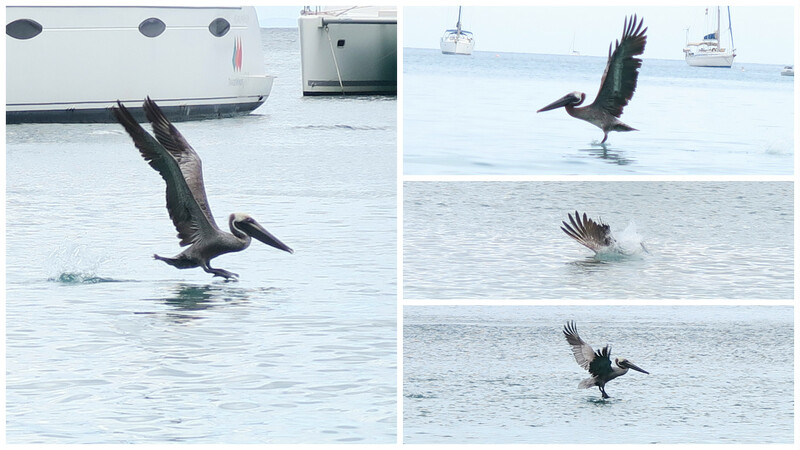 Unlike the other beaches, we saw several brown pelicans diving into the water for fish. I guess that's why all of the fish swam near us for protection! It was so intriguing to watch the pelicans circle around in the air for a while, swooping higher and higher before deciding to go head-first in the water, beaks open and ready for the catch. What was very amusing was how the pelicans would instantly dive into the water right near people's faces. Some of the people got quite a fright from that! On the way back, we got an expansive view of the cruise ships near the shore. As we stepped into the warm waters of Horseshoe Bay and observed the pink bits of coral in the sand, our family agreed that Bermuda was our favorite destination. The water was the warmest as well as the lightest, prettiest shade of turquoise which reminded me of what the ocean water looked like in Hawaii. The pink bits are actually skeletons of tiny marine organisms who live under reefs called "Red Foram"
I suppose the only downside to our visit in Bermuda was that it was the shortest stay out of all the other island visits (we only got to stay for a couple hours). There were also so many people crowding the beach, so it was hard to find a good spot to place our chairs! Compared to the other remote and far less populated islands, it seemed like everyone wanted to vacation in Bermuda at the same time! I remember learning how almost everyone in my grade had taken a cruise to Bermuda at least once or twice. It's very close to the North American East Coast, so I can understand why the shorter trip and beautiful location makes Bermuda a very popular vacation spot. Along our journey through the Caribbean, I enjoyed getting to capture some of the calming views from our room balcony. The best part of cruising, in my view, is those few serene moments where you slide open the door and step out into the warm pacifying breeze, taking in the ever-folding blue haziness in front of you. You realize in that moment that you're alone. Alone in the sense of a distinct separation from the hustling, mixed-up, unexplainably intricate world of obligations. As far as you can see and internally know, the rest of society is far out into the distance - out of sight, out of mind. So you let yourself breathe with the relief of knowing that in the here and now, this view is yours to indulge in. Some of the best moments on my past cruises have simply been leaning on the rail of the balcony and letting my focus dissolve into the rippling waves. At nighttime, it's even easier to feel the peace since the blackened waves are softly rolling by, and the stars up above are twinkling through the clouds. I can close my eyes and know that I'm safe. Once my heart beat begins to slow down to the perfect pace and my eyelids grow heavier, I eventually return to my room and drift off into careless slumber. For me, that is what makes cruises so special. Nine days is a long vacation no matter how extravagant and luxurious it is, so I'm happy to say that I'm back in the comfort and familiarity of my home. Nonetheless, I will hold onto the pleasant memories: the shared laughs, the sleeping in, the beautiful views, the refreshing saltwater and the precious time my family got to enjoy upon the island shores. 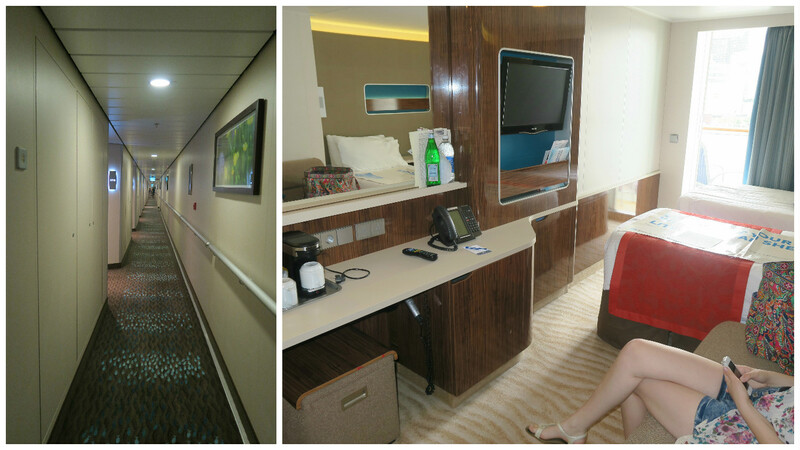 If you haven't already enjoyed the luxury of cruising, then I hope someday that you will. It's a special kind of adventure that every person should get to experience in their lifetime. And with that, thank you for reading about my travels! P. S. I also uploaded a video on my Youtube channel (click here: Madisochecmaflo) showing more of the cruise and the beaches that we visited, so you can watch that if you're interested!